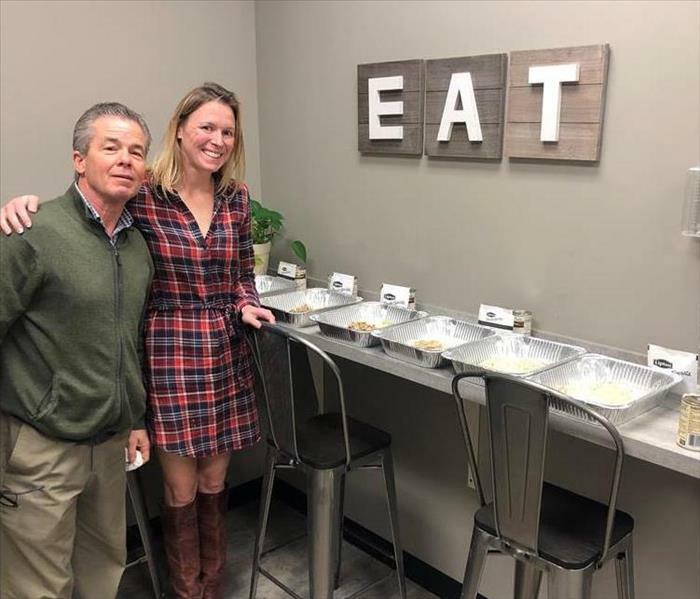 Trish Wall and Bruce Carey prepare meals for Catholic Charities of Baltimore's "Our Daily Bread" Casserole program. This program provides over 700 hot meals daily and we are proud to play a part. 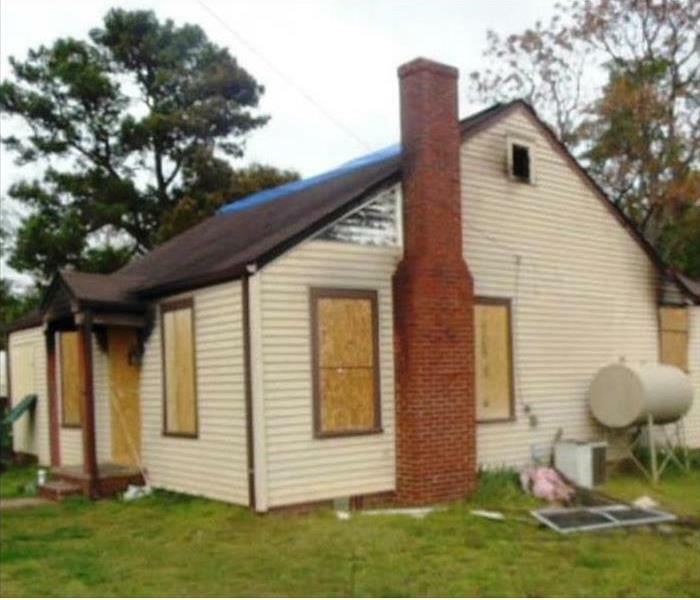 Fire damage can be devastating for you and your family. Feelings of confusion and stress are common, and you need a caring expert to guide you through this crisis. Our dedicated Emergency Responder is busy pulling together emergency SERVPRO Cares Kits he gives to homeowners when he's out on the scene of a fire. It's just one small way we at SERVPRO shows how during any disaster, we will always treat your family with the greatest empathy and respect. Why choose SERVPRO for your commercial and residential restoration needs? 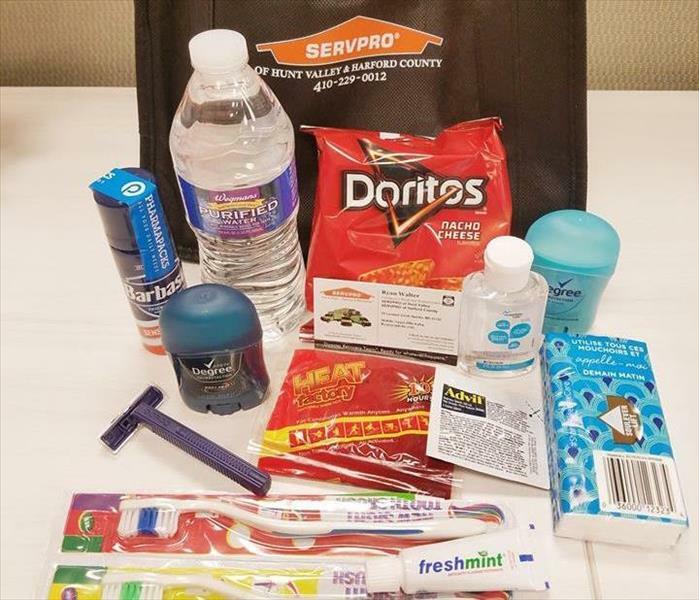 Last Friday we received a call for service at a Lutherville office building. 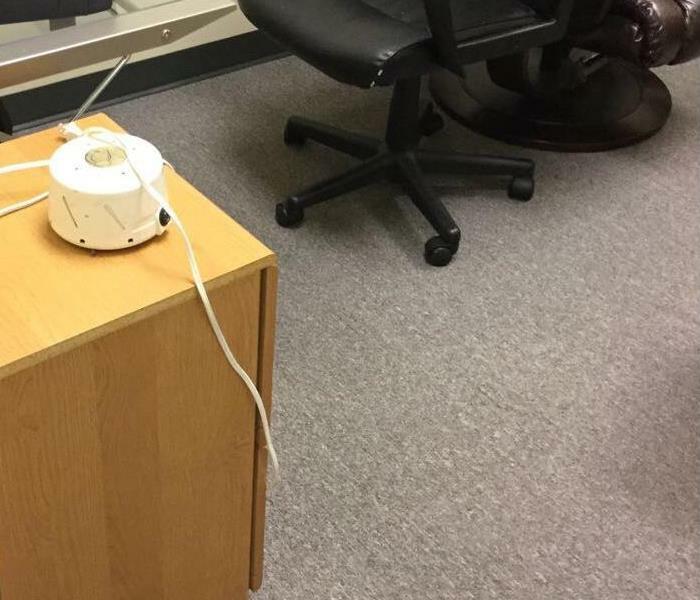 A hot water pipe had burst in one of the office suites and had affected 4-5 offices and common areas in their suite. Our crew supervisor and highly trained team arrived in just over an hour after receiving the alert. Our quick response and attention to detail met the approval and satisfaction of the property management team that was onsite. SERVPRO is there when you need us. Recently our office responded to a sprinkler system malfunction at a local university that affected one floor. 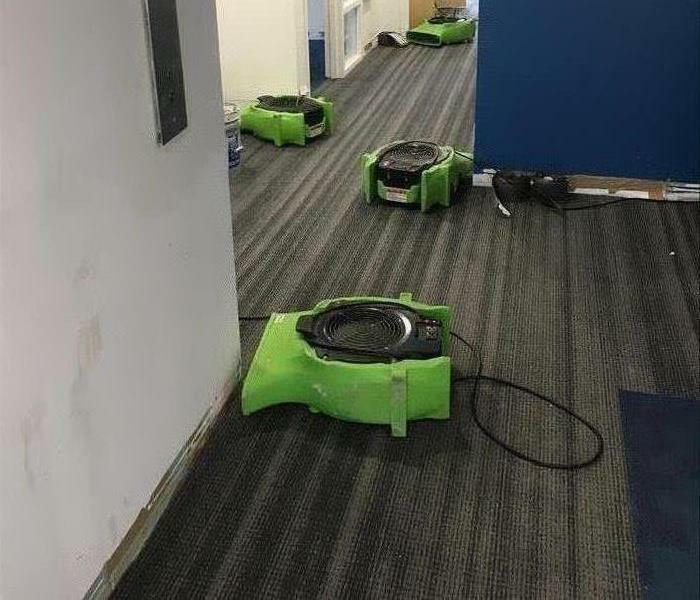 The university contacted our office because they know we are quick to respond and that SERVPRO has the trained staff and equipment needed to resolve the issue so that they can get back to day to day operations. 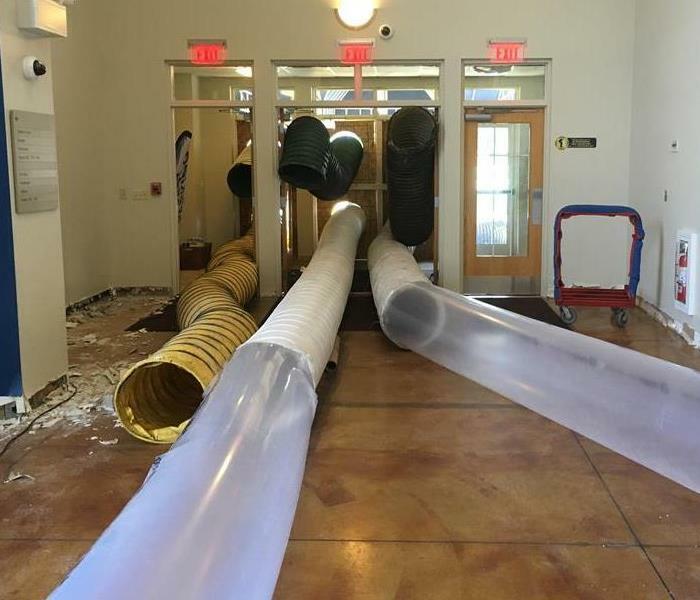 This office space suffered from a water loss after a pipe break. There was a significant amount of water on the floors and spreading throughout the offices. The air movers were put in place to dry the area quickly and prevent future damages. SERVPRO responded to this commercial water loss. There was significant amount of water in the floor. 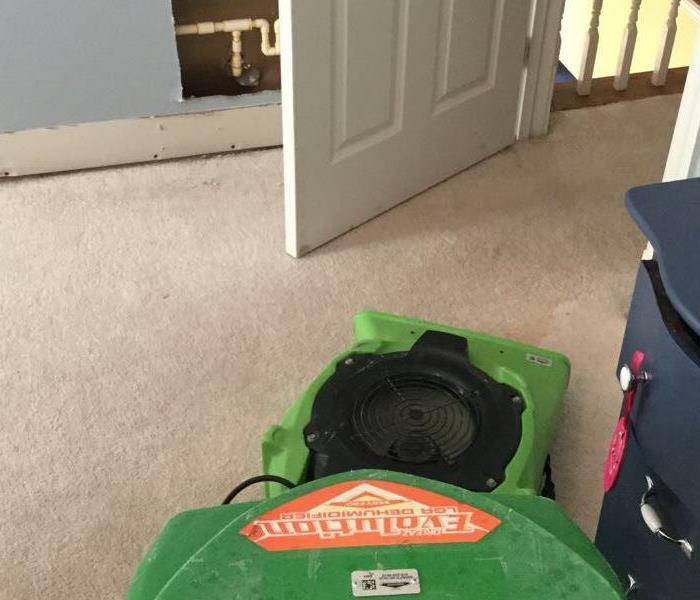 There was significant water damage and SERVPRO was able to extract the water and dry properly, restoring back to normal working conditions. Contact us for your commercial restoration emergency. After the pipes froze in this commercial building they suffered from a significant water loss. There was water covering the flooring. They brought in equipment to dry the building quickly preventing future damages. SERVPRO has the professional cleaning techniques and equipment for your air duct cleaning needs. They were able to completely clean this home owners system and remove the dust from the duct work. 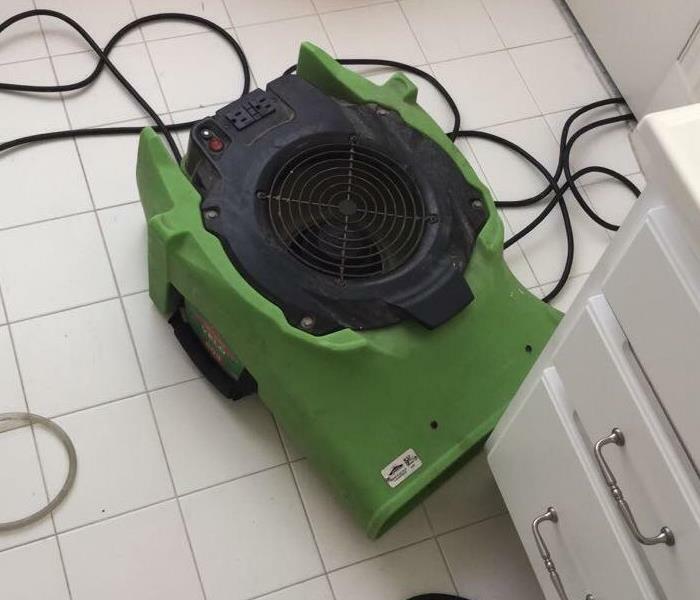 SERVPRO has professional drying equipment for your water restoration emergency. The restoration team has the trained expertise and equipment for mitigation. The team is ready to respond anytime 24/7. This bathroom suffered from a water loss on the second floor. The team at SERVPRO responded immediately to access the loss and begin mitigation quickly. 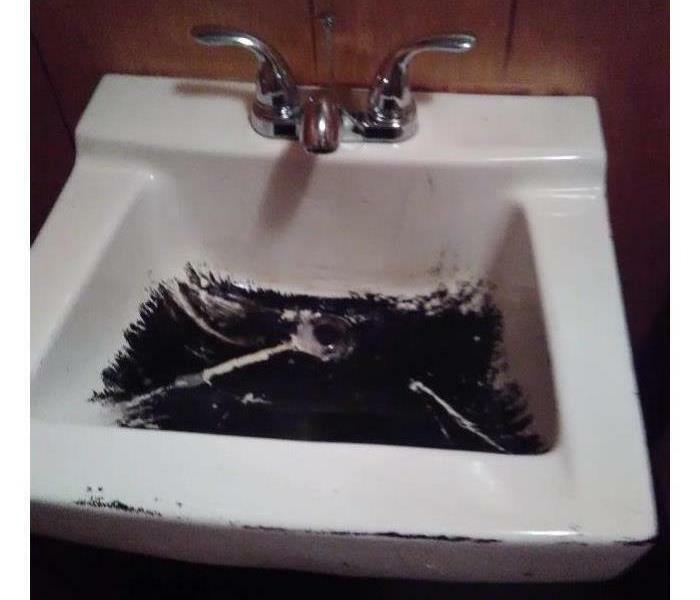 They were able to restore the bathroom back to normal conditions. How to dry a large commercial space? 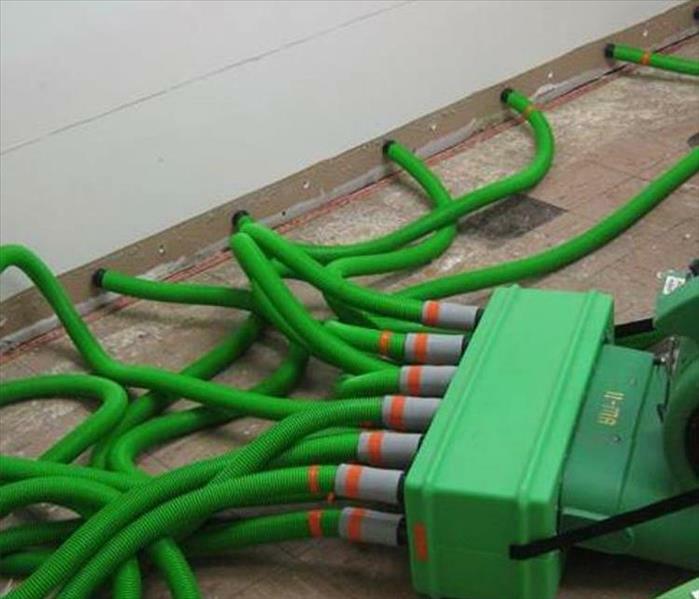 If you have a large commercial space, SERVPRO has the equipment and expertise to dry any job. It is important to make sure you get us on site immediately to prevent secondary damages from happening. Who can help clean up a commercial water loss? If you have a water loss in your business, SERVPRO is available to help 24/7. Our teams are quick to respond and can help from start to finish with your property. If you have any questions, feel free to reach out at anytime. This church suffered from a significant amount of water. SERVPRO responded with professional drying equipment to dry the area quickly preventing future damages. They were able to get the church back together quickly and restored back to normal conditions. Robin is always willing to help with anything and anyone. She is eager to take on any task and to learn new processes. 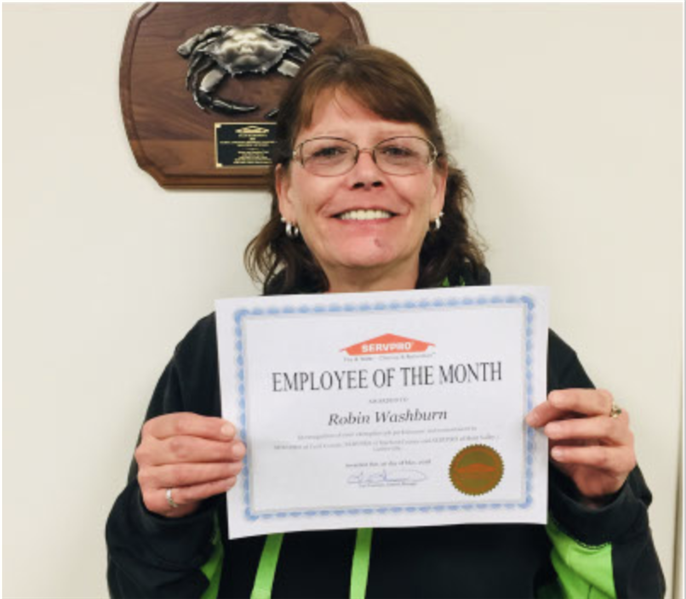 Robin comes to work everyday with a positive attitude and a warm smile. Robin has been with us for 11 months! We can always count on her! 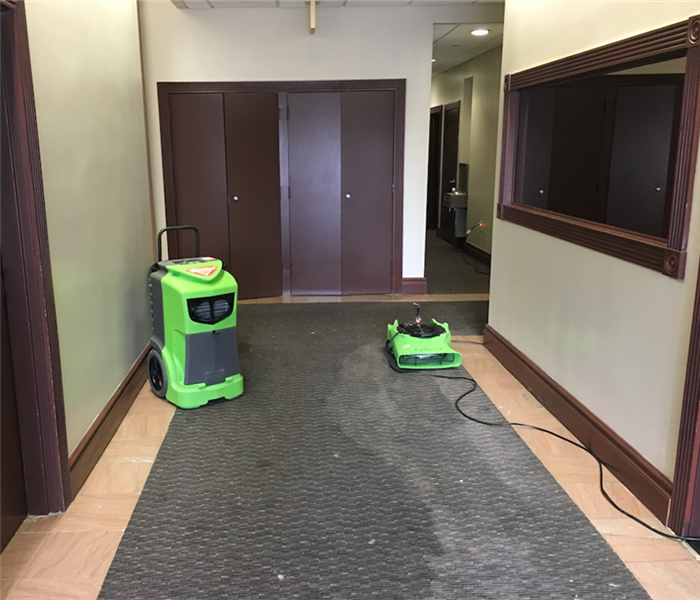 SERVPRO of East Harford County was called to help this company when water had flooded a couple of floors. The water was dripping from the ceilings and running down the walls after a pipe burst on the third floor. 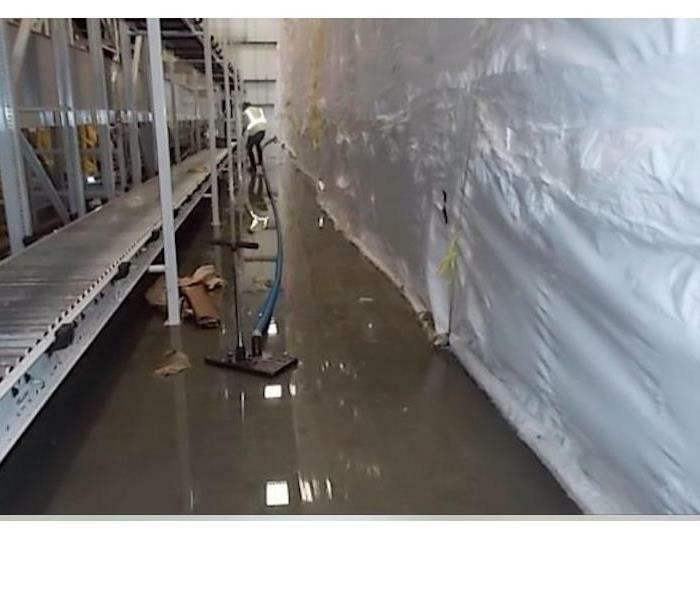 The facility in this image suffered a large water loss situation and our team was called in to handle the cleanup. You can see some of the equipment we brought in to help with the drying in this image. In this image, you can see one of our technicians, hard at work, making sure that no moisture is left behind to cause any further problems after this facility suffered a large water loss situation. Over the last month our team has worked extremely hard. We wanted to take the time to celebrate them but having a day of food and games. They work around the clock to make sure that everyone is properly taken care of. 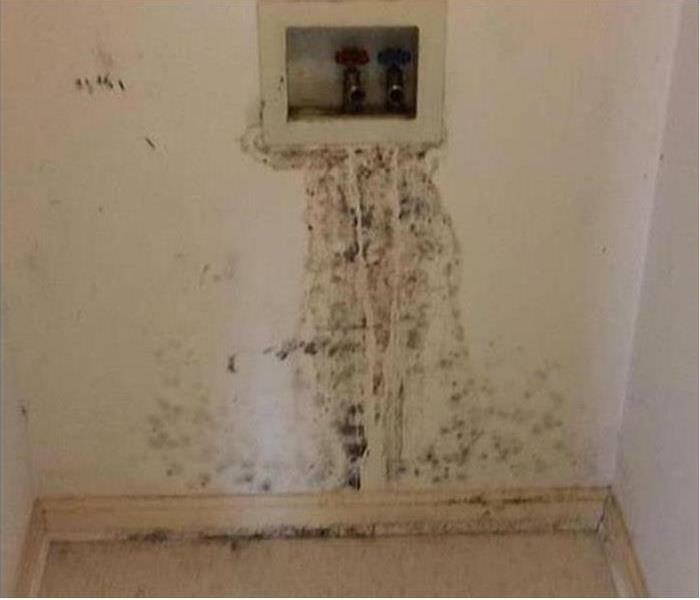 The mold in this picture was caused by a leak in the supply lines going to the washing machine. A moisture problem like that can result in a mold problem like this quickly. If it happens to you, call us! This area suffered from significant water loss. The drywall was affected and had to be torn out because of water damage. The large air movers were used to quickly dry the area and get in back open quickly. This floor was damaged with water after flooding entire wood floor. 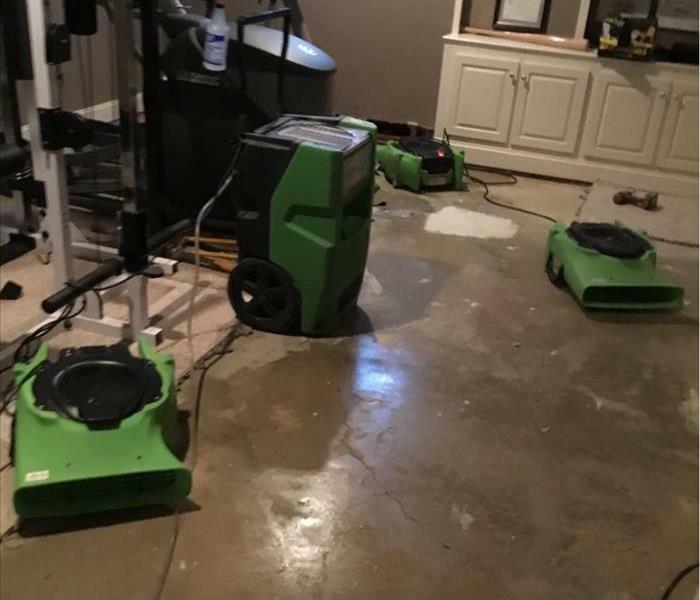 SERVPRO extracted the water and quickly began drying the floor to keep the wood from getting damaged by the water. The area suffered from storm damage. The drywall was wet after water damage to the ceiling. 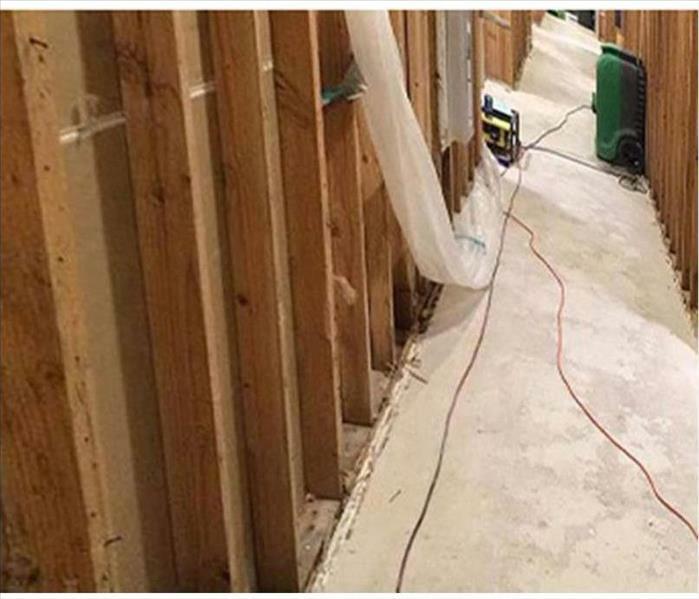 The drywall was removed and dried with special equipment SERVPRO uses to quickly remove water and moisture. The drywall was torn out of this commercial building after finding mold damage. The area was cleaned professionally by SERVPRO. 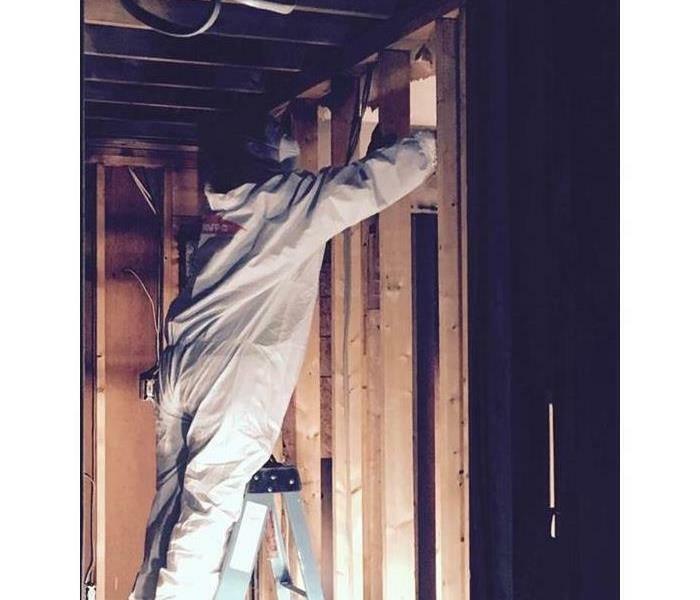 They are ready to respond to any mold remediation quickly 24/7. SERVPRO has fire restoration crews ready to respond to any fire emergency. The teams are trained on techniques for cleaning after fire and ready to respond 24 hours a day 7 days a week. SERVPRO specializes in different cleaning procedures and processes for any type of restoration emergency. They have the equipment to clean carpets after a water loss to your home or business with professional carpet cleaning system. SERVPRO responded to this water loss. 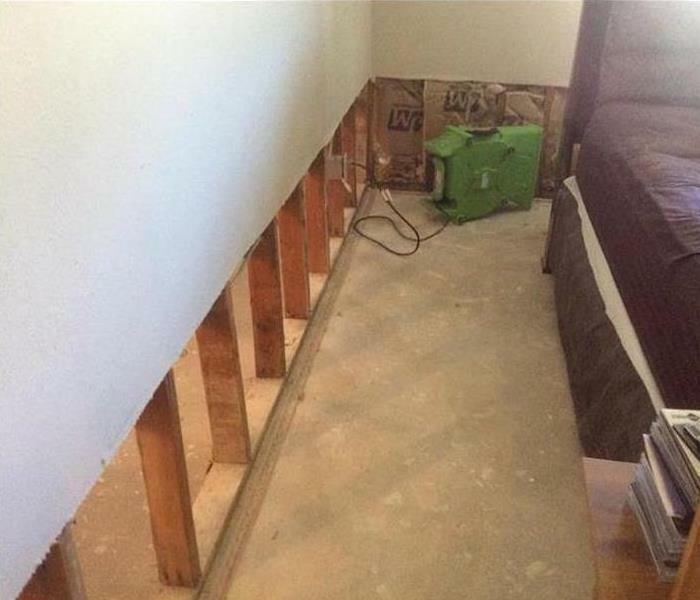 They ripped out the baseboards and brought in air movers and dehumidifier to dry the area quickly and prevent any future damages in the room. This ceiling has mold stained and SERVPRO was called to clean the stain. They have special cleaning techniques to ensure mold is cleaned properly. It can be dangerous to have mold growing in your home or business. SERVPRO has professional cleaning equipment to use on any size restoration emergency. They are trained on all types of techniques and processes to respond to your home or business quickly. This facility had a massive sewage backup. SERVPRO was on site and began the cleaning process immediately. Once all of the harmful substances were properly removed, SERVPRO was able to disinfect and finish the cleaning process. SERVPRO was called to help clean this fire damage in Harford County. It is important to make sure the entire structure is properly cleaned before starting any of the rebuilding process. Once the entire structure is clean of soot and smoke the rebuild can begin. Fire's can erupt anywhere, even in a bathroom! But there is no need to worry. SERVPRO can help you with ANY size fire damage you might encounter in your home or business. SERVPRO understands that you live a busy life, so we want to help get things back on track quickly! Give us a call anytime, we're always available. (410) 420-4022. 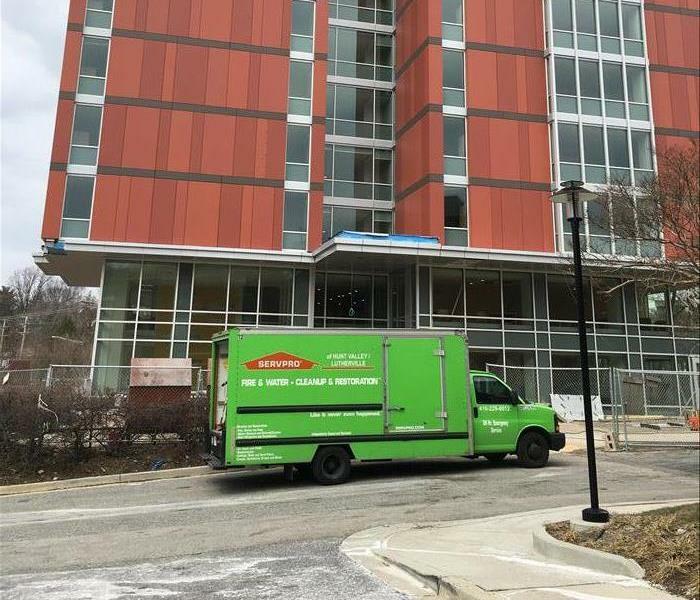 SERVPRO of Harford County working hard on a commercial water loss! We can assist you with any size water loss you might experience in your home or business. Give us a call, we're open 24/7, 365 days a year. Some water losses are worse than others. This job needed its flooring removed before the drying process could start after a storm. The air movement and dehumidification will dry the room in under 5 days. 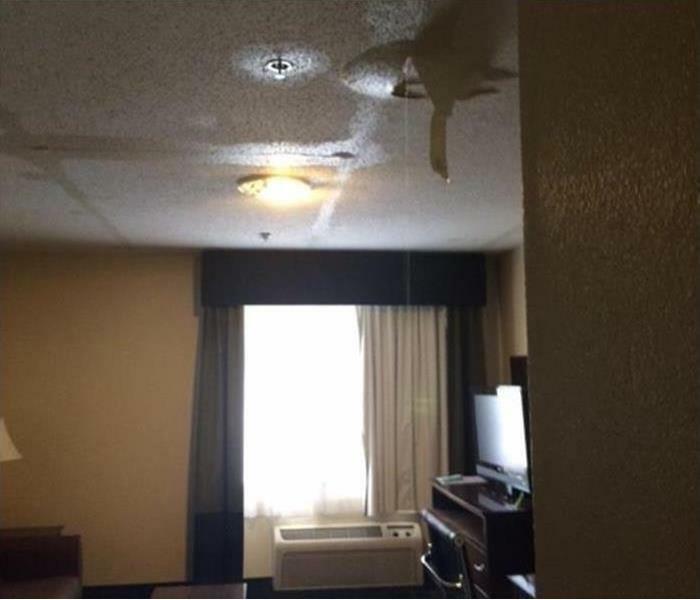 The sprinkler system leaked water down through the ceiling causing damage in an Edgewood motel. By quickly fixing the dripping pipe, and directing heated air to the wetted areas the material was saved, and no demolition was needed. Dehumidifiers helped with the drying, and the room was ready for occupancy the following day. SERVPRO helps you keep your doors open for business. When an unnoticed leak moistens the drywall cardboard backing the result can be mold damage to the wall and the baseboard. 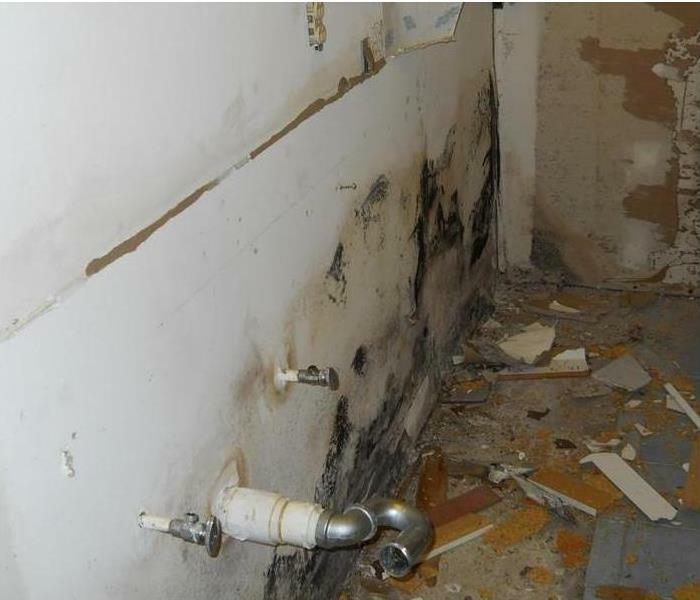 Remediation of this damage requires a removal of a portion of the wall and infusing anti-fungal agents into the cavities to kill existing mold patches and spores. Then the restoration can proceed to finish the job. A sudden and severe storm blew through Riverside and dislodged a tree limb which crashed into the attic of this home. The cleanup starts with tarping the exposed roof to keep out vermin and prevent further wind or rain damage. 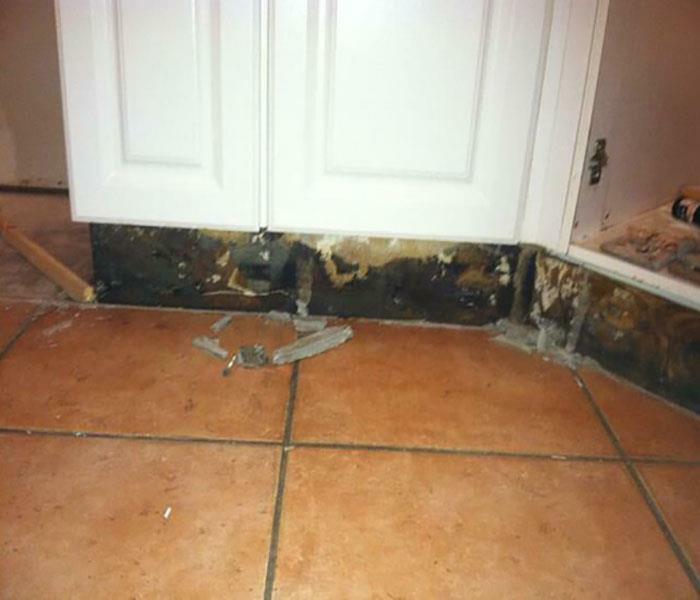 The removal of all damaged elements then can prepare the damaged kitchen for a restoration. We were called in to secure this structure in Edgewood after a kitchen fire caused significant damage to the roof and the interior. We placed blue tarps to protect the interior from further damage and boarded up the windows and door to secure the house from animals and curious persons. The water from the restroom flooded the flooring in this hallway. We removed the vinyl baseboard coving, drilled holes and inserted snakes to remove the water and moisture without removing the wall. This minimized disruptions to the school day. Before going up for sale, this bank owned commercial property in Edgewood need some serious mold remediation work. We started by setting up containment and then demolishing the drywall that was not salvageable. Several pieces of equipment are visible as were continuing with our task. 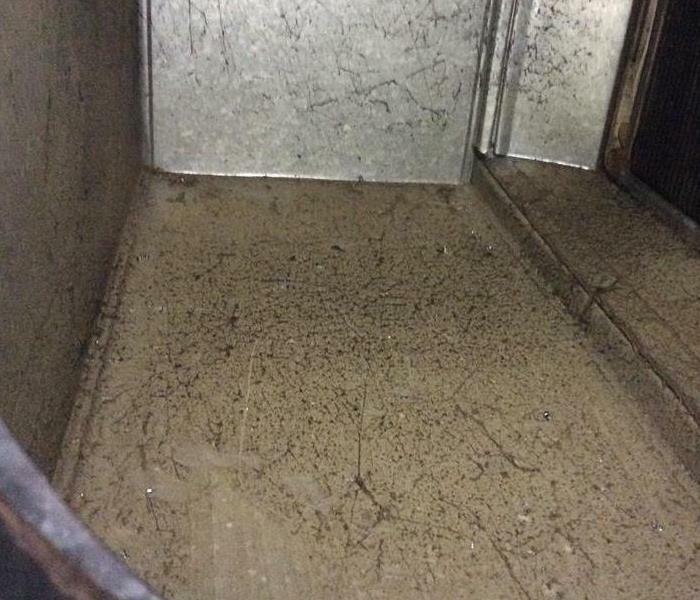 The kitchen base cabinet hid the leak from view long enough for an aggressive growth of Black Mold to form. Here we removed the sink and all the cabinets before we cleaned up the debris to further inspect the troublesome area before removing the infested drywall. We then disinfected the kitchen. Storm damage occurred at this Aberdeen home when a window was broken by debris blown in by high winds that accompanied a passing series of thunderstorms. The broken window allowed a large quantity of rain water to enter the home which soaked the flooring and some of the walls. If storm damage affects your home or commercial facility, call SERVPRO of Harford County at (410) 679-6260. We proudly offer 24-hour emergency service, and we are equipped to deal with any size disaster. 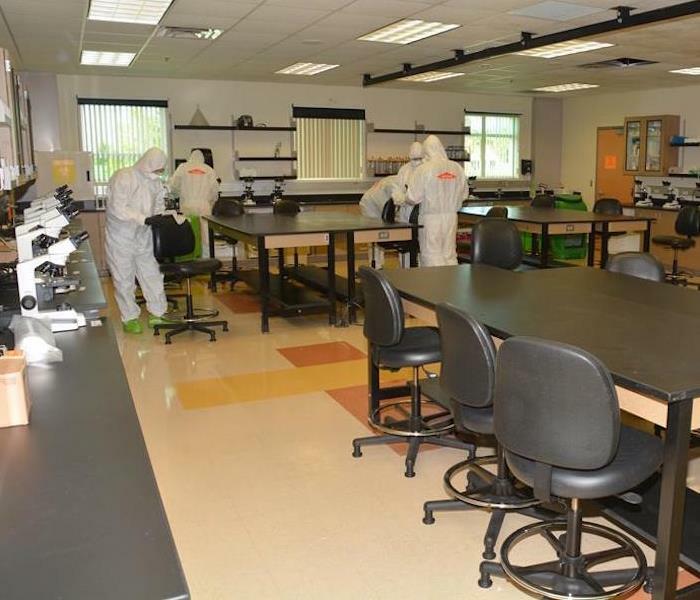 Commercial mold remediation for this Aberdeen medical lab was serious business. After drying and dehumidification with industrial quality air movers and other proprietary equipment, manual cleaning was performed. Then all surfaces were treated with an antimicrobial agent to thwart future outbreaks of mold growth. This kitchen had a severe case of mold damage. 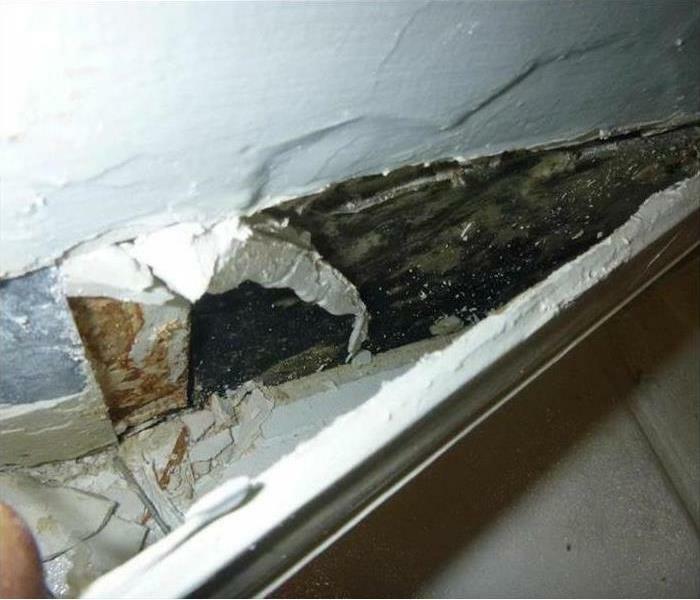 A leak was the main cause of the mold damage. Thanks to SERVPRO the mold was removed and kitchen restored back to new. 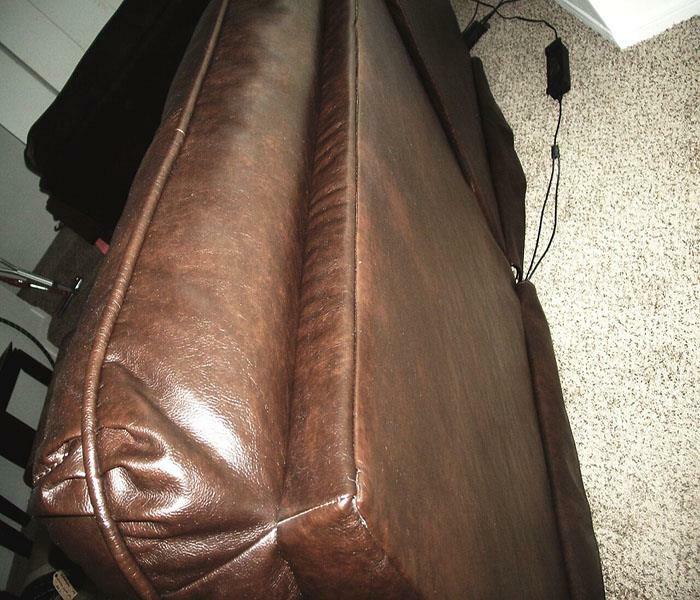 This couch had major soot damage due to a fire. The couch was covered in soot and ash that the owners were worried they may need to get rid of it. Thanks to SERVPRO the couch is back to new and the clients are happy. 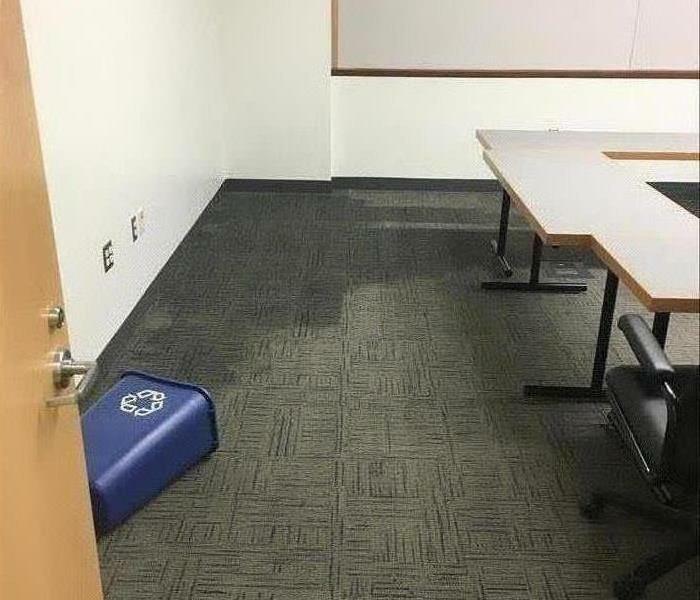 This room suffered from major water damage. The water had damaged the walls severely. SERVPRO of East Harford County came in and fixed the damaged room. 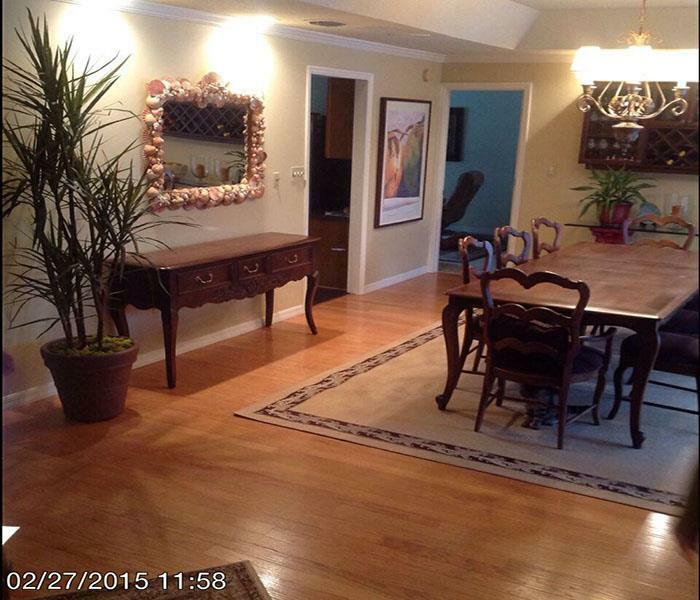 The place looked great and the homeowners were very thankful for the work provided. Bel Air flood damage occurred in this 12,000 square foot building spreading over most of the facility. 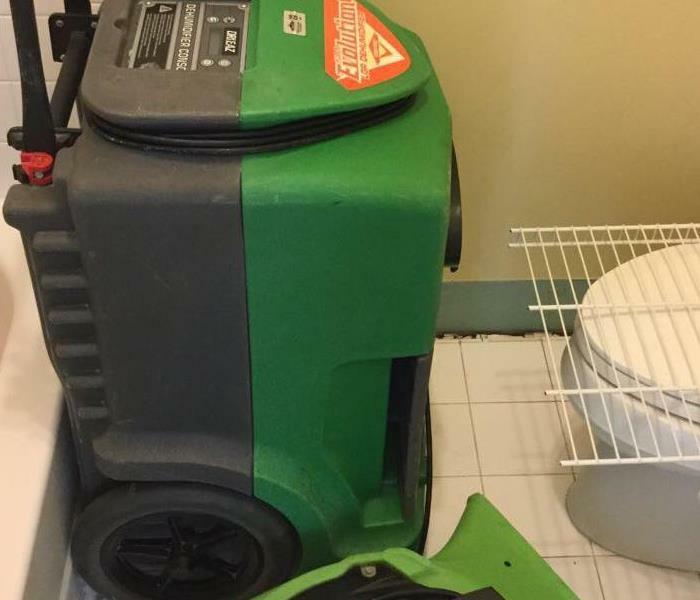 SERVPRO of Harford County used this large desiccant dehumidifier to dry the water and moisture damage. This advanced equipment is the number one method of effectively removing moisture and was needed in this large loss situation. SERVPRO of Harford County is hereto help. Call us 24/7 at (410) 679-6260. Fire damage in this Fallston Garage left mostly ashes in place of the structure. The fire did not spread to the house, but smoke damage did not spare the dwelling. SERVPRO of Harford County was contracted to provide the fire damage restoration process for the garage. As part of the project we provided smoke damage restoration to the house. SERVPRO Franchise Professionals help restore many fire damage incidents each year. We do everything we can to make it “Like it never even happened”. We are here to help. Call us 24/7 at (410) 679-6260. 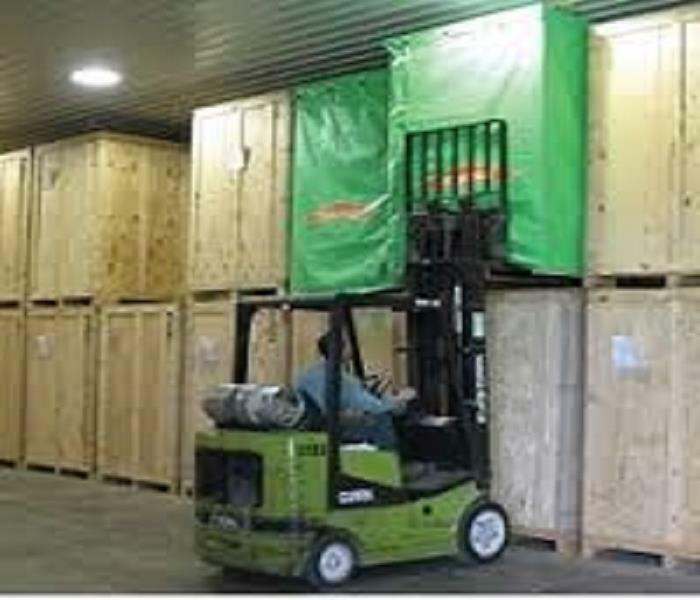 When storm damage in Bel Air compromises a structure, moving the contents to our facility for restoration and storage is often the best option. SERVPRO of Harford County provides all phases of storm damage restoration and the process moves faster with the contents removed. We board up or tarp sections of a home exposed to the wind and rain. We remove all materials that cannot be restored and restore the ones that can. We thoroughly dry your home using sophisticated moisture measuring equipment to document the process. We provide the construction needed. 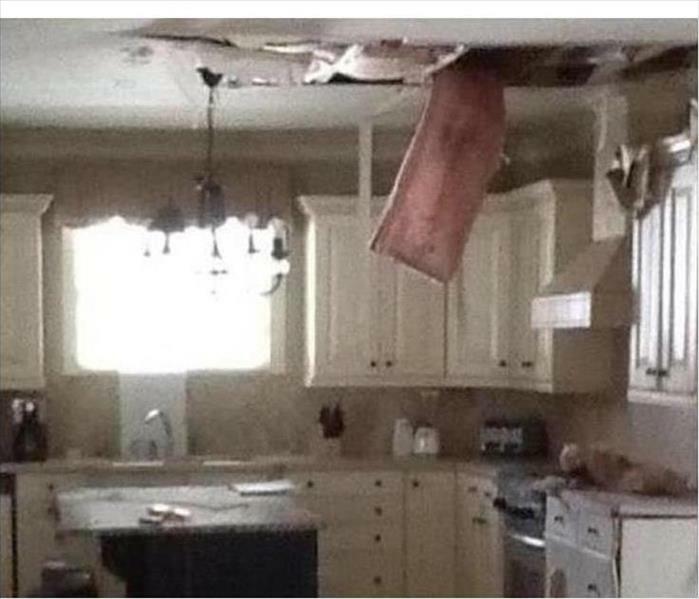 We help with the storm damage insurance claims. No job is too big or too small for SERVPRO of Harford County. SERVPRO of Harford County is available 24/7 to respond if you have an emergency. Call (410) 679-6260 for help.